The flash bracket / umbrella swivel I'm using works just fine, but I'm a little nervous about the way the flash attaches. It's held in place by a combination of friction from screw on the side of the flash bracket itself plus friction from screwing down the wheel on my flash's shoe/foot mount. Since the bracket is metal and my flash is the older Metz 48 AF-1 design, with plastic foot, I feel a bit nervous about clamping too tightly. But if I don't, it seems like there's a risk of the flash just sliding right out either the front or back, especially if the bracket gets tilted. Is there a better little cold-shoe product that's less scary? I'm not aware of anything which has the Pentax-specific locking pin slot (except this which is out for price), which would be a little comfort, but that's not necessarily the right approach either. It seems like there ought to be something where there's a secure latch on the front and back, so once mounted the flash can't go anywhere (but which could still be easily undone). I can't find it, though. This accessory shoe at least has the front blocked, which might be an improvement, but on the other hand it lacks the side friction screw. It's the Frio Universal Cold Shoe Adapter. It's exactly designed for what I need, and at a little over ten bucks it fits under my price limit, too. So I ordered one; here's the report! It's a little rectangular piece of relatively tough plastic, with a cold-shoe "pocket" near the front and a flexible clip to hold the flash in place. 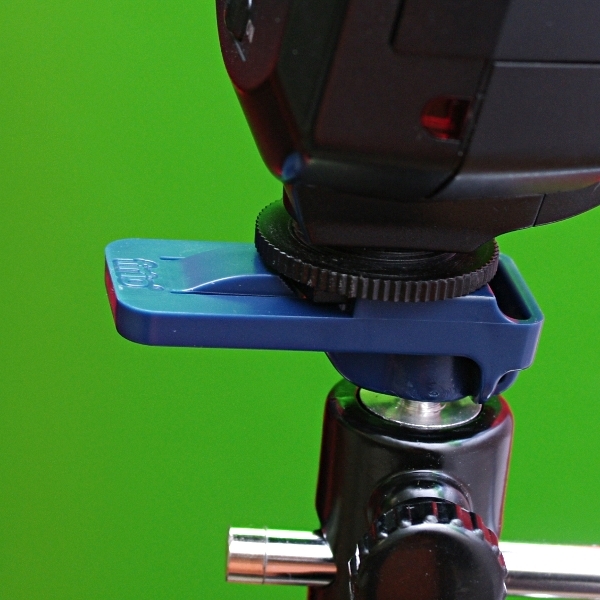 Underneath, there's a securely-attached metal socket, threaded for a standard 1/4" tripod screw. It works; my Metz flash snaps easily into place and is held there securely. Until I tighten the wheel on the flash shoe itself, the flash wobbles from side to side a bit, but there's clearly no risk of it going anywhere. Once the wheel is tightened, it's steady. 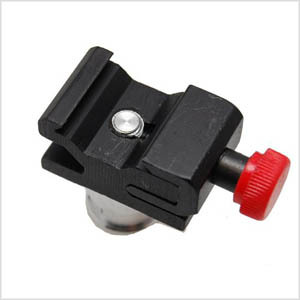 The clip to release the flash is molded from the same piece of plastic; it flexes down or up to provide the locking. I didn't have any difficulty or frustration working it — in fact, it's easier and faster than the screw mechanism of my existing cold metal shoe. The clip seems secure and it does appear to be high quality plastic, but if you take your flash on and off the clip dozens of times a day, it may wear out. The other thing worth mentioning is that since the screw doesn't go entirely through the clip, you may want a nut to tighten underneath the clip. It holds well enough without but that would feel even more secure and make it easier to fix the clip so it definitively faces one direction even if bumped. It's a little pricey for what it is, but that's typical for niche products from little companies. And when compared to the generally high prices for this kind of photo equipment in general, it actually seems within the realm of reason. Given that it seems to do its job so well, I'd say it's worth it for the ease of use and the security for my flash. You can get it with free shipping from Amazon, or get the triple-pack for under $30 including shipping — get one for multiple light stands, or split with a friend. Yep, this answers my question. I hope this or similar clips become standard, but until then, this'll do. Not the answer you're looking for? Browse other questions tagged equipment-recommendation off-camera-flash flash-bracket or ask your own question. What's a decent lighting kit for getting started with portraits?